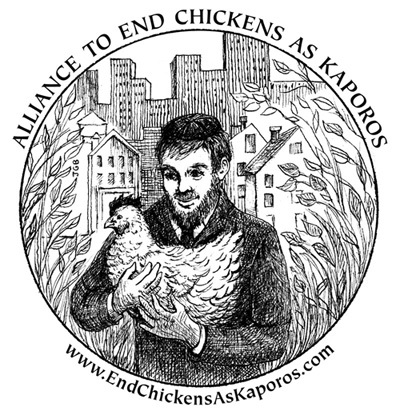 Kaporos practitioners treat the chickens used in their ceremony of slaughter very badly. They deprive them of food, water, and shelter for days awaiting the slaughter, trapped in their own waste. They hold the chickens painfully and injuriously suspended by their wings. Their children taunt the chickens in front of their parents, whose attitude was expressed by a practitioner on October 1 in Brooklyn, who said the chickens are “nothing.” The Kaporos atmosphere is that of a carnival with loud music playing and a bleak, horrible spirit and smell of misery. The chickens are thrown dead and alive into plastic garbage bags; most are not given to “the poor.” Health codes and animal cruelty laws are broken by practitioners with impunity. More and more rabbis are publicly condemning this ritual. They are urging practitioners to swing money for charity in Kaporos, instead of hurting and killing chickens.